Creative Warsop is holding a free exhibition to showcase the creative endeavours of local residents and groups. The exhibition is open to everyone and will be held at The Shed @ The Adam Eastwood Building, Wood Street, Market Warsop, NG20 0AX on Thursday, 5 April between 1.30pm and 6.30pm. Everyone from the community is encouraged to drop in to discover more about local craft works by local groups such as InfoTech creative learning groups, Meden School, Warsop Youth Club, the Stitch and Sew Group, Melville Court Craft Group and the Warsop British Legion. 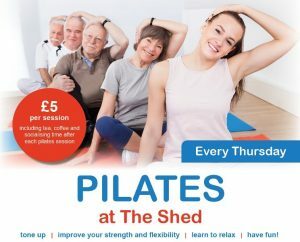 An initial course of six pilates classes at The Shed proved so popular with local residents that pilates sessions are now being offered every week on Tuesdays between 10am and 11am.